There are a lot of different materials you can use for your kitchen floors. And while you can make a strong case for all of them—from linoleum and tile to rustic brick and other affordable options, it's hard not to love wood floors in the kitchen. There are a lot of different ways you can go with wood floors—from raw and original to glossy dark woods and painted colors, too. To inspire a home renovation or a kitchen makeover, we've rounded up some beautiful kitchens with hardwood floors. We love looking for DIY and decor inspiration from the colorful and creative blog, A Beautiful Mess. In this tour of Emma's kitchen, you see how a bunch of different textures and colors can play well together. We love the touches of graphic art and pops of yellow that make the original hardwood floors feel fresh and modern. The name might throw you, but don't skip on Lumber Liquidators just because the name implies fire sale discounts. Cassandra LaValle, the founder and creative director of Coco Kelley, wanted to give her kitchen a makeover to "increase creativity flow and decrease stress." Featured recently on The Everygirl, she used white oak, which is used throughout her home. In the kitchen, however, she opted for a wider plank, which helps distinguish the space from the rest of the home. With lots of natural light, white cabinets and a light color palette for the tile backsplash, the white oak helps amplify the bright, airy feel of the kitchen. Sometimes you really can't go wrong with a lot of white. Such is the case with Jenni Li's Kitchen, recently featured on One Kings Lane. In her Brooklyn home, she took advantage of the ample natural light to double down on an open, bright aesthetic with painted wood floors in a stark white that matches the cabinetry and ceiling. How eye-catching are these grey parquet floors from LochAnna Kitchens in England? Parquet floors remind us of a Parisian pied-à-terre, but in this grey color and with wide planks, the look feels a bit softer and more contemporary—perfect for this sprawling and family-oriented kitchen. Featured on lifestyle blog The Glitter Guide, Paige Geffen's kitchen has us swooning. Against the modern, sleek combo of stainless steel and glossy white cabinetry, the organic, uneven color of this wood floor brings the whole room back to earth. It feels welcoming and warm, ready to welcome guests with bare feet. We cannot get over how stunning these dark stained oak floors look in contrast to the bright aqua backsplash of this kitchen. A 2016 feature on A Beautiful Mess showcased how Laura gave her kitchen a striking makeover that has us reconsidering that all-white-everything kitchen trend in a big way. What goes better with the timeless color combo of white and blue than a rich hardwood? If you ask Megan Papworth, who's kitchen remodel was featured on The Glitter Guide, the answer is absolutely nothing. We love this high contrast kitchen with trendy industrial and brass fixtures—it has a nautical vibe that makes you feel out to sea in the best way. Mixing different types of wood sounds like a recipe for disaster, but this kitchen proves to be the exception to the rule. The home of Debbie Propst, president of One Kings Lane, was featured on the site's blog recently, and we were struck by the unusual combination of woods contained in such a small area. 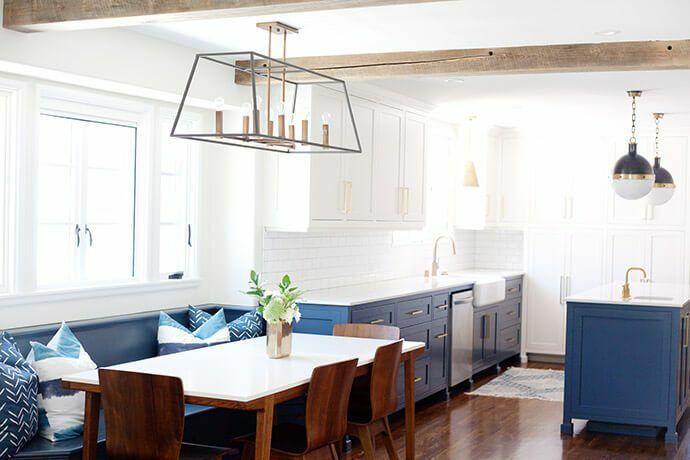 In her home in Connecticut, you can see large wide planks of rough wood, smaller, glossy planks in a more blonde hue, and then yet another wood on the kitchen island, as well as reclaimed wood beams on the ceiling. It's incredible, and we're obsessed. Another stunning example of how you can modernize a parquet floor, we love how this oak design from John Lewis helps this large kitchen feel even more open but still special and welcoming. In a 19th Century Parisian apartment, Scandinavian interior designer Jessica Vedel and Talcik & Demovicova Architects created an amazing contrast between modern minimalism and old world charm. These vintage wooden floors feel so distinctive and memorable, it would be amazing to try and recreate the look in a new space.